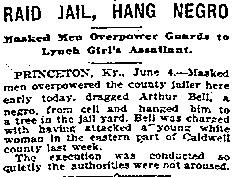 Killed June 4th, near Princeton, Kentucky. Bell was removed from a county jail where he was held pending trial. No arrests were made, nor was the jailer disciplined for losing his prisoner. note: This article incorrectly states the incident took place in Princeton, New Jersey. 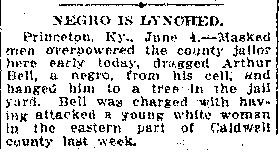 It occurred in Princeton, Kentucky.